Trained as a graphic artist, David lives at Harrietville. Keen anglers will be familiar with his work as he did the covers for the Australian Fresh Water Fishing Magazine for two years. He has done similar detailed work for magazines overseas and is in demand to do commissioned paintings for clients in both hemispheres. Simply titled Ted, the portrait of a well known Smoko identity was a show stopper at the 2003 Bright Autumn Art Exhibition. It stunned people with its veracity and illustrates why David is so highly regarded. 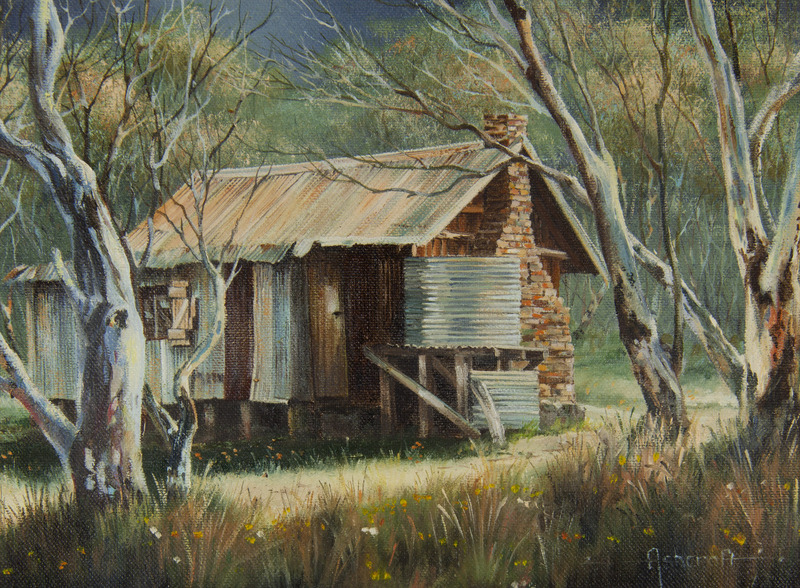 The other painting J B Hut in Summer, won the miniature section at the 1993 Autumn Art Show.